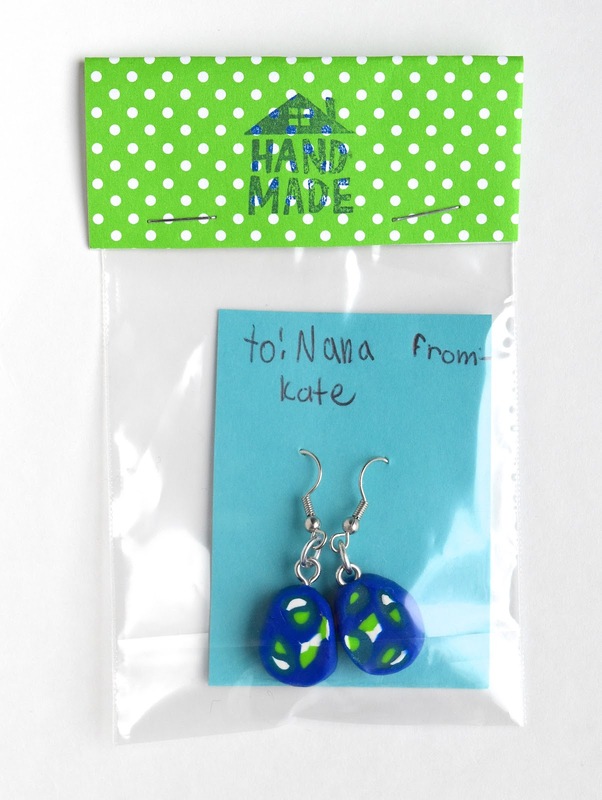 Another short post today to share some of the kids' handmade gifts. 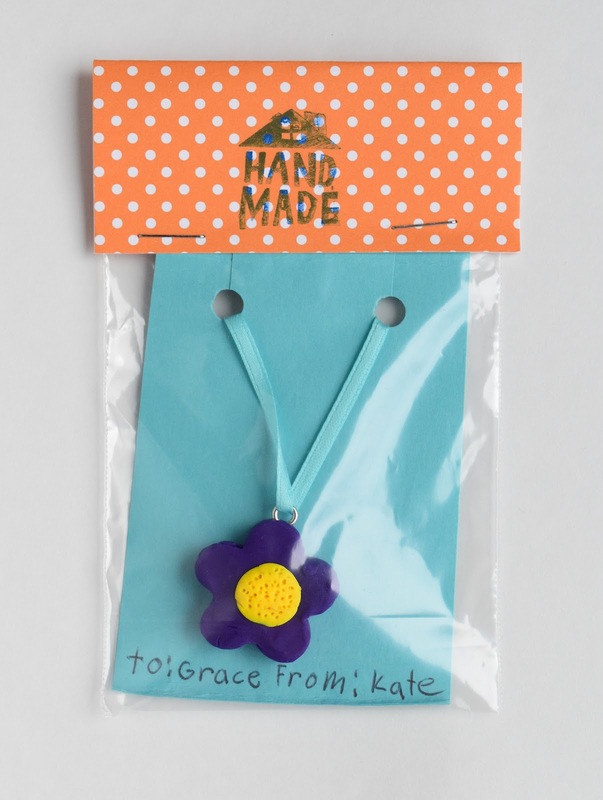 Kate has been dabbling in polymer clay this year. It all began when I gave her this book for Christmas last year. Before that, she'd been playing with Model Magic and leaving tiny little sculptures all over the house to dry. I remember playing with clay as a kid (we used Das Pronto) and loving it, and thought she might like the permanence and solidness of the end product. 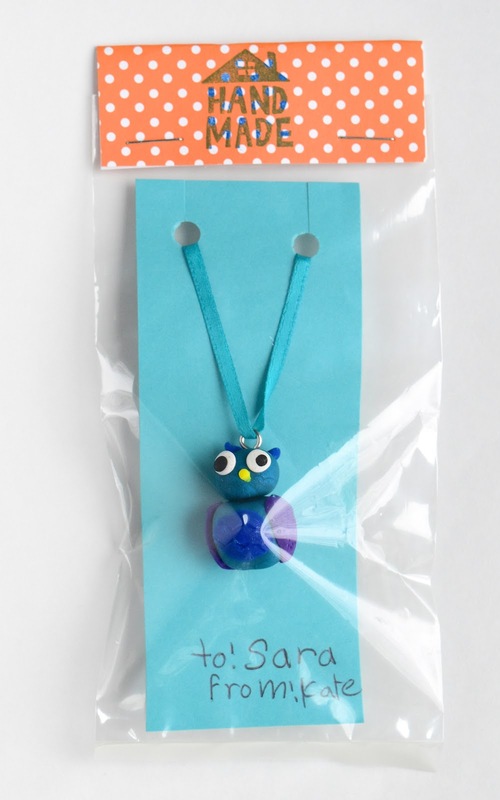 Polymer clay is much easier to work with, particularly for kids, and it doesn't harden until you bake it. And all year, she's been making all kinds of tiny creatures from that book, as well as creating her own. And giving them away to everyone she knows. Some of the steps were beyond the capabilities of a 7-year-old (e.g. attaching the hooks and other findings), but otherwise, she ran the show. 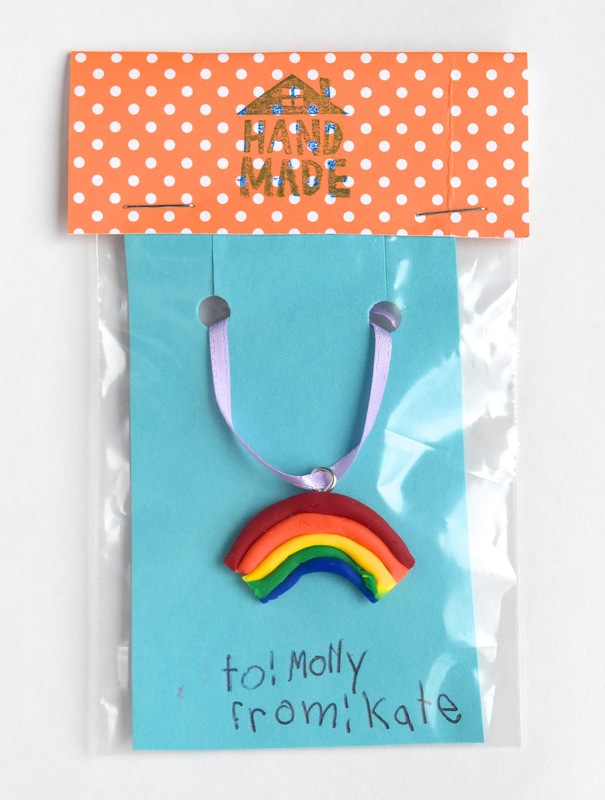 Funny story: the kids were initially suspicious when I suggested that we could actually make "real" jewelry. When, as evidence, I showed them my stash of jewelry findings and suchlike, they were astonished. And when I told them I used to make jewelry way back in the day, they didn't believe me - as far as they'd known, I'd only ever sewed and played with cardboard. It's humorous how kids forget you had a different life before they were born, isn't it? Anyway, another blast from my handmade past was this packaging. 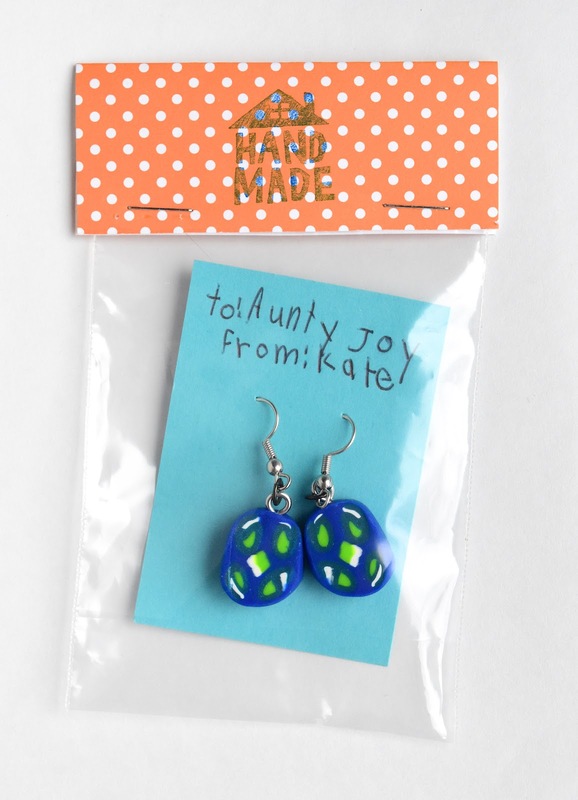 Again, completely different from how my own jewelry pieces were packaged back in the day, but while digging into that old stash, I found the little plastic bags I'd used and thought Kate might get a kick out of fancy packaging for her clay creations. 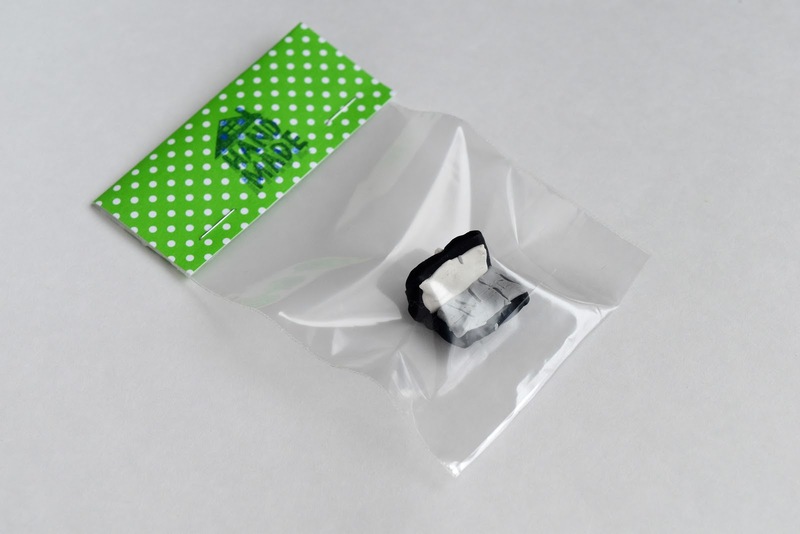 We used scrapbook paper and this little Handmade stamp and made little packages. The girls were amazed at how "professional" they looked. 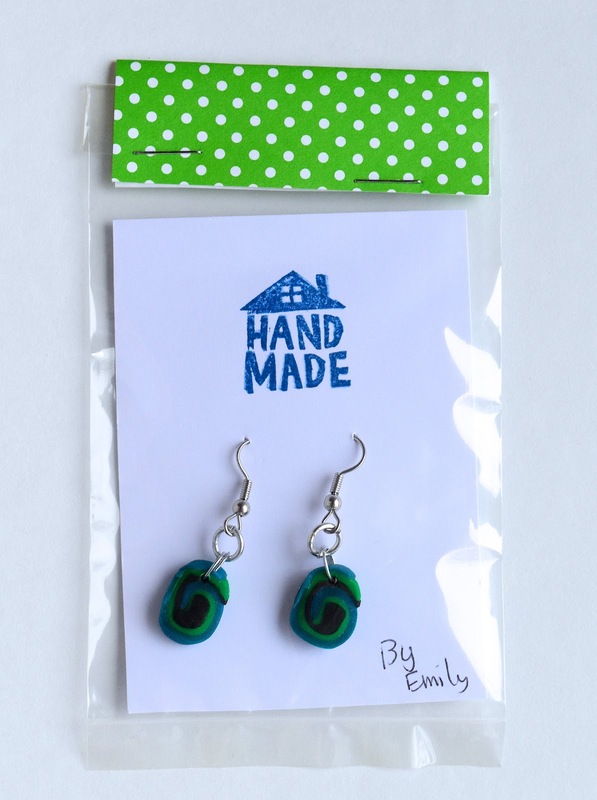 And see - another pair of earrings. It appears Kate has caught the mass-producing bug! These photos are all a bit funky because they were completely unpremeditated. We were in the middle of wrapping the clay packages for Christmas one evening when I thought I'd shoot them in whatever fading light we had left. 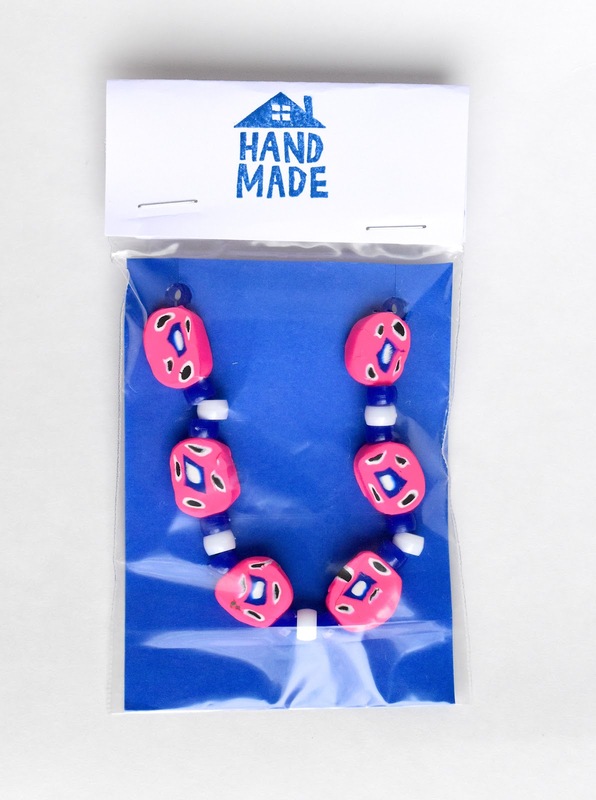 More than just to document a fun crafting and learning session with the kids, I thought you guys might like to see how easy it is for kids could make really nice stuff in clay and package it in ways that do justice to all those hours of work and love. The girls did all the packaging, by the way - I showed them an example, and they stamped and stapled all by themselves. Here are some of Kate's lockets. I could have strung them on actual metal chain necklaces but these were her projects, and we picked narrow ribbon so she - not I - could do the actual assembling. 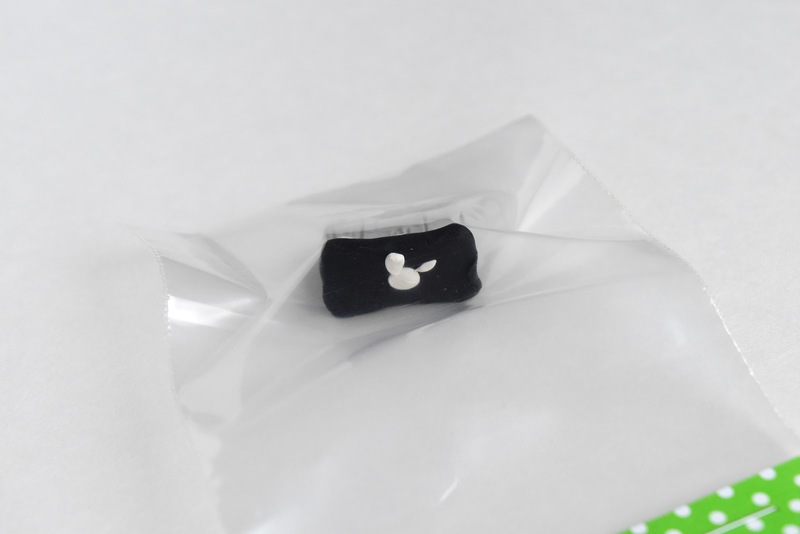 To mount them within the package, we punched two holes in cardstock, slit the top edge of cardstock to the holes and slid the necklace ribbon through them. 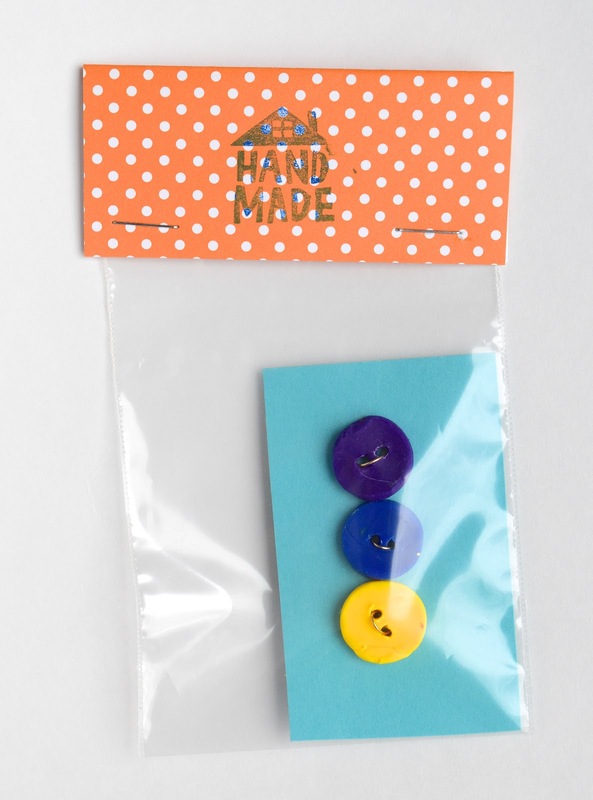 Here are some buttons for another sewing-loving family member - we giggled as we mounted them like the ones in the fabric store, twisting flexible wire through their holes. Finally, here's a non-clay gift. 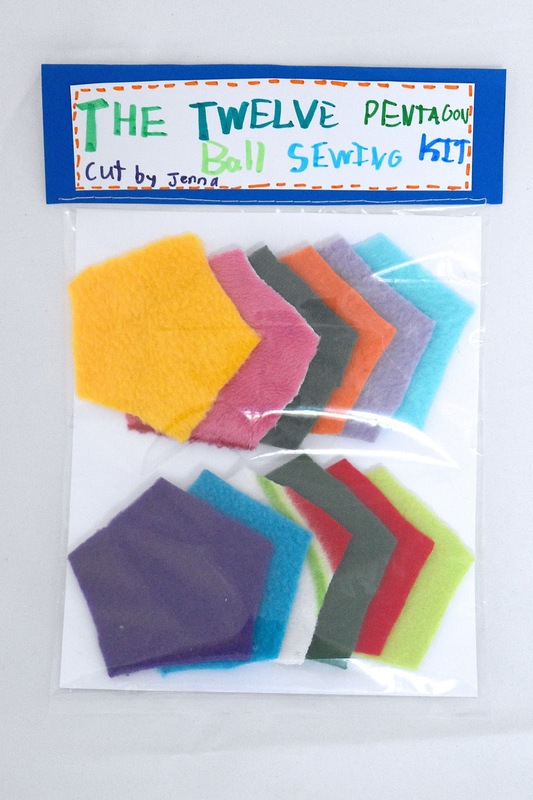 Emily has been hand-stitching scraps of fleece into 3D shapes recently, so Jenna made her a sewing kit, based on Abby Glassenberg's ball tutorial. She chose 12 colors of scraps, cut out pentagons and packaged them into this cute kit for her big sister. How sweet to get a hand-made present created with such thought! I love how your girls are catching the crafting/mass-producing/creative thinking bug. Did the pentagon ball sewing kit come with instructions? Yes, it did. But not in our kit - we just referred Emily to Abby's post, and she followed along. I'm sorry for this late replay, by the way . Such lovely gifts! I should get some bags like this so my kids can package up their gifts "professionally". It's good to hear that Kate liked that book; it has been on my "to maybe buy for the kids" list for a while. 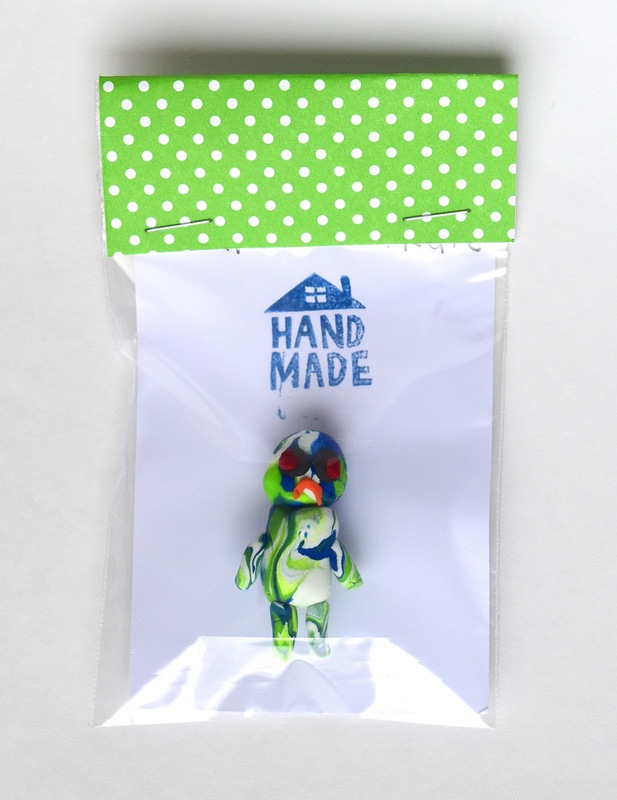 I need me some kids to package my handmade stuff. Awesome doings. Amazing stuff! You have great kids. Project Sighting: On-The-Go Bags and a Giveaway!